Next Saturday the 19th of August there is a celebration at Terra Natura for Petita the elephants birthday with an Indian style water and colour party. Terra Natura Benidorm celebrates a new edition of this hindu festival to commemorate the 45th birthday of Petita the elephant. This sad story that the Asian elephant of Terra Natura suffered goes back to, years ago, when her weight was less than usual for this species. This caused her to be disowned by the other elephants of her herd, that saw her as less attractive. But with the help of her partner Kaiso, she was able to integrate, slowly, in the herd of elephants that lived in the complex and to be accepted by her partners. The programming starts with a parade with musicians, dancers and artists attired with Sharis – typical hindu dresses – they will go to the elephant installation, where Petita and her partner Kaiso will be, they will receive a fruit and vegetable offering. 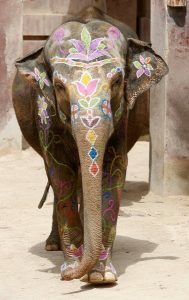 Petita was discriminated by her herd as she was considered ugly according to the beauty standards established in the species, so both elephants will be painted with bindis and ornamental drawings as done in the hindu tradition. After singing the “Happy Birthday” song to Petita with the public congregated in the Napastepur village, the colour and water party will begin. To create a Holi festival ambience, there will be Bollywood songs and dances. The powder that will be used in the festival have all been done with natural pigments. In India, the Holi festival brings the family together to forget any problems they may have and to bring the happiness of the colours to the town.